The day started with a gap down opening and tested 3330 levels straight away at 10.00 A.M. Market was expecting RBI announcement at 12.00 P.M . Nifty 1 min charts clearly shows the formation of positive divergence providing a nice oppurtunity for traders to long the market. When the RBI announcement came markets tested newer days low after few volatile minutes. But still MACD(3,10,16) is showing positive divergence which is nothing but a bullish signal to go long.Since then(after 12.00 P.M) markets tested 3420 levels in Nifty futures. But the scenario is different after Nifty is facing huge resistance near 3420 levels which is just above the 200 day Moving average line in Nifty 5 min charts till 1.30 P.M and started moving down below 3420. Such action also observed in yesterday's intraday action also. And finally closed below 3365 during end of the day. Nifty hourly charts are little bearish as there is a formation of negative divergence in nifty hourly charts with hourly support at 3350 levels. 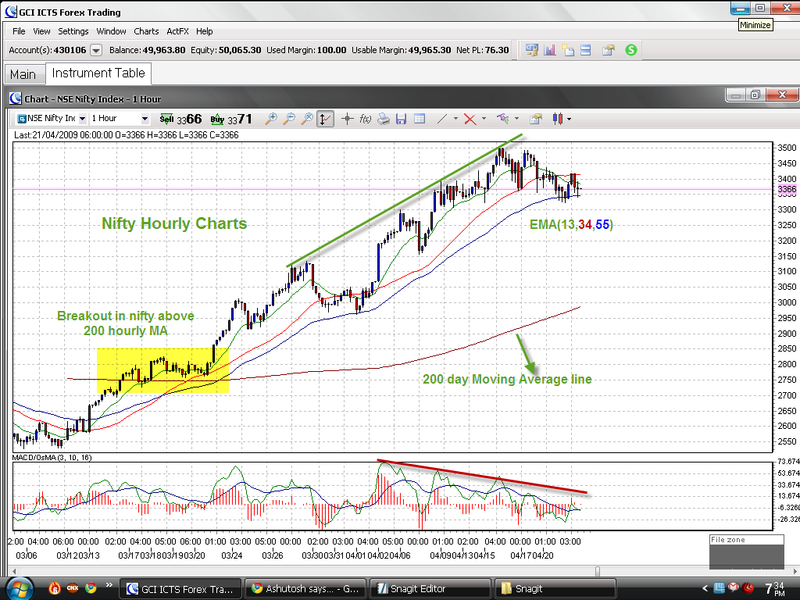 Supports are found by applying 13,34,55 EMA principle and currently nifty is trading exactly just above 55 EMA line. 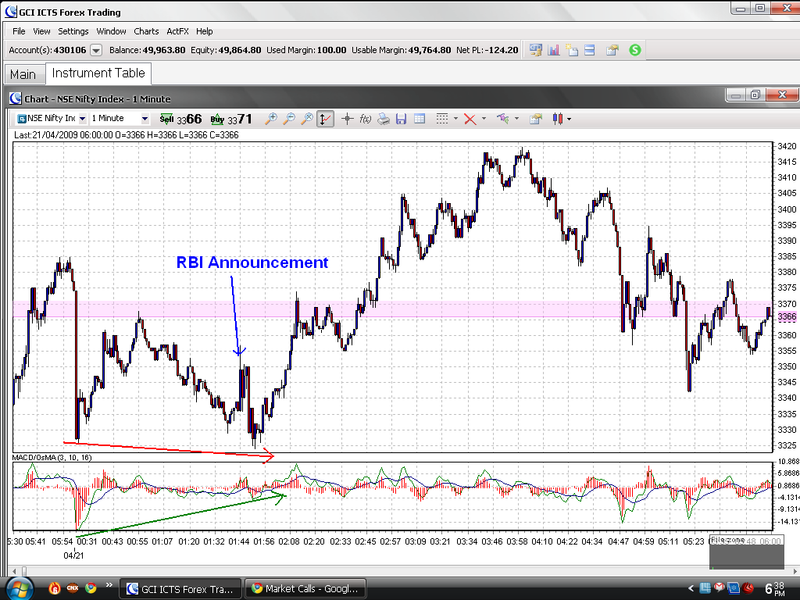 Looks more breakdown is likely to come if nifty fails to take support at 3350 levels. 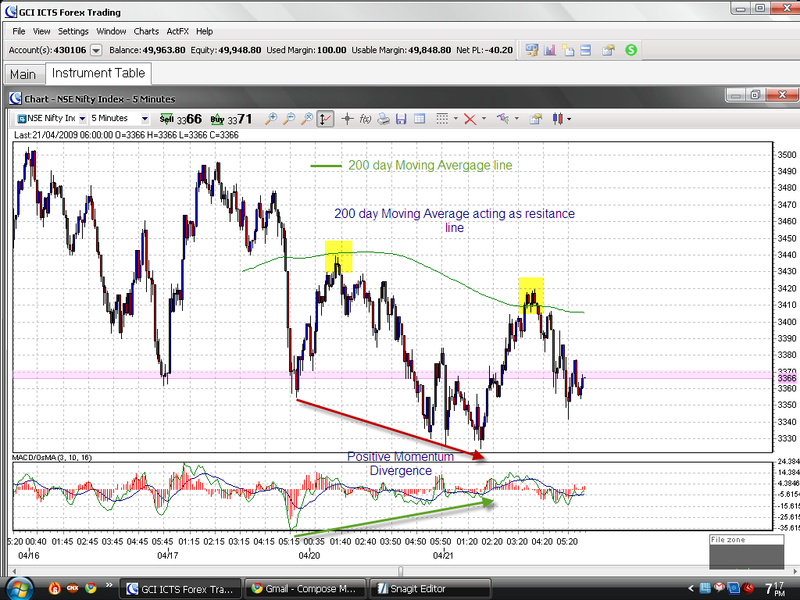 Bearish Negative divergence confirms us that market is likely to turn negative if 3350 levels are removed on down side. dear rajandran,according to the 5dema,nifty shud now move down,isnt it so?